Ald. Peter Braithwaite (2nd) speaks at Monday’s City Council meeting. The council unanimously approved an ordinance that allows for the automatic expungement of juvenile criminal records. Aldermen voted unanimously to approve an ordinance that allows for the automatic expungement of juvenile criminal records at Monday’s City Council meeting. The ordinance requires the city to automatically expunge law enforcement records if the events occurred before the individual’s 18th birthday, one year has passed since the date of the arrest, no petition for delinquency or criminal charges were filed and six months have passed without an additional arrest. 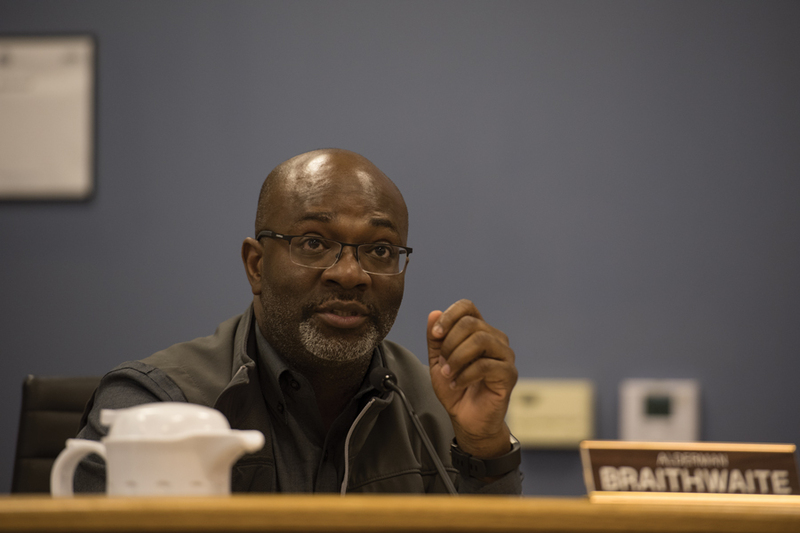 A second, companion city ordinance would codify and incorporate requirements from the state law into Evanston Municipal Code. Since the ordinance passed, Ald. Cicely Fleming (9th) said she wants to ensure the Evanston Police Department communicates that the new ordinances exist and informs the public in how to utilize them. The amendment to the city code comes after a request from the Alternatives to Arrest committee, chaired by Ald. Peter Braithwaite (2nd), to incorporate the Illinois Juvenile Court Act into the municipal code. The act was previously amended in August 2017 to provide additional privacy protection to juveniles who had been arrested and prevent law enforcement from disclosing records of minors who committed ordinance violations. The amendments also allow for juvenile records to be expunged automatically, without a petition by the individual. Evanston complies with the act and has administrative procedures in place to execute the requirements, according to city documents. The new ordinance works with the act by also clearing juvenile administrative hearing records in addition to law enforcement records. The ordinance is intended to protect juveniles against any potential damage that could arise from arrests or other violations, especially the stigma that could result from their disclosure, according to city documents. “The City Council finds that the disclosure of such juvenile records can be a hindrance to an individual’s present and future ability to obtain employment, education, housing and credit,” the documents state. During the process, Braithwaite said, Northwestern law Prof. Carolyn Frazier and members of her staff met with EPD. Juvenile records will be more comprehensive and easier for residents to understand as a result, he said. Braithwaite added that Frazier praised EPD’s record keeping. According to city documents, both the act and the ordinance are in line with the purpose of the Alternatives to Arrest Committee, which Mayor Steve Hagerty formed in April 2017 to find alternatives to arrest for misdemeanors and reduce the number of young adults “that have a difficult time finding a job later in life.” The committee created a subcommittee to review current record-keeping policies and procedures.